I could spend my time visiting new places, but I may as well start again visiting places I've already been. I can forget a lot, I find - even some pretty amazing things. What do you know about Hadrian's Wall? If you're American, like me, you have a good excuse: it doesn't get talked about much. I don't know about the rest of the world, but dang, there's a lot that doesn't get talked about in the U.S. Shock number one (for me): the Romans controlled the island of Great Britain for almost 400 years, beginning around 43 AD. Wow. (Caesar had sent forces there 100 years earlier, in 55 BC.) 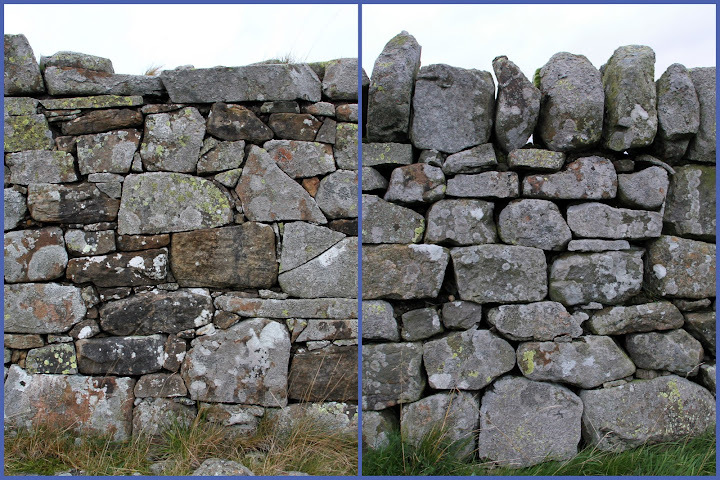 Hadrian was the emperor of Rome from 117 AD to 138 AD, and on his third trip here he ordered, in 122 AD, the building of a 72-mile wall bisecting the isle to keep out the barbarians from Caledonia - the Scottish. Shock number two: large parts of that ancient wall, now pushing 2,000 years old, are still standing. I went to a museum about the wall (which I'd seen briefly in 2004) and was looking at statues and various ancient relics like coins and tools. What I really wanted to see was some kind of video recreation, cuz these bits of museum signboards and a rusty piece of whatever just weren't cutting it. The next day I went to the wrong museum (blame my GPS's owner) and watched a fantastic 3D movie, showing the wall in its full glory, as seen from the view of an eagle flying overhead. It was exactly what I was looking for! Half an hour later, a short distance from the museum, I was walking next to this 1,900 year old wall, built by the Romans. My mind just went blank, and I was filled with the most delicious awe. I can't really describe it, but the scope and history of it overwhelmed me, and my mind became so quiet. May you find awe and wonder in your life. What excites you? What are you passionate about? Start there! Before we get to the wall, first the "other things" from the blog title. I "wild camped" (not in a campground) near these cliffs in Norfolk, and walked about six miles along the the coastal trail. I love the shape and angles of this bird. Ah - I'm now in the famous Lakes District. Home to lakes, mountains, and spectacular walking. I went for a few hours walk around a lake. We walkers got lucky with the weather today. And the only time it really rained I ducked into this abandoned slate mine. This estate is just across the street from Wordsworth's house, near Grasmere. It happened to be on the walk. This area is the wettest part of England. That looks right to me. This little bridge, crossing a small creek to reach a pasture, is unremarkable in this part of the world - which I find remarkable. Think of the physics of that arch: those stones are all trying to fall, but can't because they push on each other and onto the slanted walls. If those walls were to move apart from each other, the whole thing would topple. I let my GPS tell me what route to take to the next campsite. This is called a "single-track" road. My van fills the road, and when a car comes the other direction someone needs to find a wide spot to pull over. This wasn't a busy day, but it's not a very relaxing type of driving! This explains why the campground owners said, "You drove over that pass? In THAT van??!" Do you know how steep 30% is? If my van stopped on 30%, I don't think it would go up again - I'd have to back up first - which in fact happened. I had to back up down a super-steep, super-windy section. I came really close to missing the corner, which would have stuck the van and the other car. Not fun. Sometimes my choices surprise me. This is Lanercost Priory, the oldest parts of which date back to about 1170 AD. Oh, so much history, including when King Edward I and his posse stayed here for five months when he was on his way to tame the Scots. It was torn down, mostly, when Henry VIII, the benevolent one, wanted to shtup someone more fertile, and the Catholic Church said no to his divorce. The store rooms under the ruins of the church. Lanercost happened to be in the volatile area between England and Scotland, who battled for centuries. Many of the buildings here are built as defensible fortresses - even farmhouses. A tombstone on the floor of the church. Looking at the ruins from inside the part of the church which is still in use. ...continued: "Remembering that you are going to die is the best way I know to avoid the trap of thinking you have something to lose. You are already naked. There is no reason not to follow your heart." This is a still from a video I took. England, really, come on. This is a two-way road? Hadrian's Wall! It was originally about 15 feet, or 5 meters tall. It continues along the edge of the cliffs, and up and down some very steep bits. Vast parts of the wall were pilfered over the years and ended up in churches, castles, houses and even sheep fencing. The wall was built by the military, which had its own architects and engineers. Yeah, the Romans, whatever. But Kevin Costner was in a movie right here! This is known as Sycamore Gap, and apparently it was featured in the Robin Hood movie. These delightful young people were hiking for some days along the wall and staying at bed and breakfast inns along the way. They looked like they were into computers, but I didn't want to ask. I didn't really need to, either! A wooded stretch, just next to where the wall had been. Only a small wall is there now. The wall continues off in the distance, over the wooded hills above the lake. I'm sure the dye makes it easier to identify their sheep, but its not helping my photos, thanks. I read that they all need to be tagged, regardless of the dye. Sycamore Gap from a different angle. There were forts and crossing points every mile along the 72-mile wall. There would have been a road going each direction - left towards Scotland and right into England. Remnants of the wall are running up the hill, and you can see what's left of the protective ditch on the right side. There was a 12-foot ditch, initially only on the north side, and eventually on both sides of the wall. It prevented, or slowed down, a full-scale attack of the wall. It's not clear why they built one on the English side, other than perhaps to keep people in. At this point, the original foundations can be seen, but there's only a thin modern wall on the outside of it. Further along you can see where the full-width wall begins again. Look at the difference between these two sections of the same "modern" wall, just a little ways apart. For my rock wall internship, I want to go with the guy from the left side. Hey - it's my brother's birthday today! Happy Birthday Miguelito!